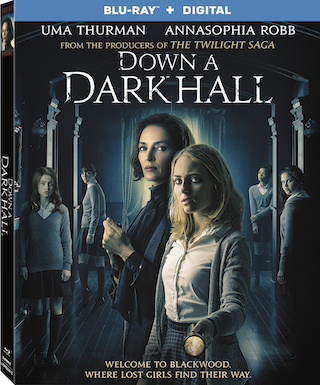 The 2018 film “Down A Dark Hall“ starring Uma Thurman and AnnaSophia Robb is coming to Blu-ray Disc on October 16th via Lionsgate. The film, directed by Rodrigo Cortés, co-stars Isabelle Fuhrman, Victoria Moroles, Noah Silver, Taylor Russell, and Rosie Day. Tech specs for the film include full 1080p HD video in the 2.39:1 aspect ratio with DTS-HD 5.1 Master Audio sound. The release will come with a Digital Copy of the film included. The title is now available for PRE-ORDER over at Amazon. Bonus materials set to be included on the release are listed below. The full official announcement about this release can be found further below, after the break.